– starting with the concept, realizing the idea until we guarantee harmonization of customer requests and production possibilities. Through its Design Department of well trained professionals and computer specialists the company is able to serve the customers and create unique glass containers. Priority in company policy is continuous renovation of technological equipment – new high – production glass forming machines, tools, machines and equipment for uninterrupted quality control of the products, incorporating new technologies and processes. In order to achieve world quality standards Rubin undertook developing and integrating the Quality Management System according to the requirements of the international standard ISO 9001:2015, ISO 22000:2005, ISO 14001:2015 and OHSAS 18001:2007. 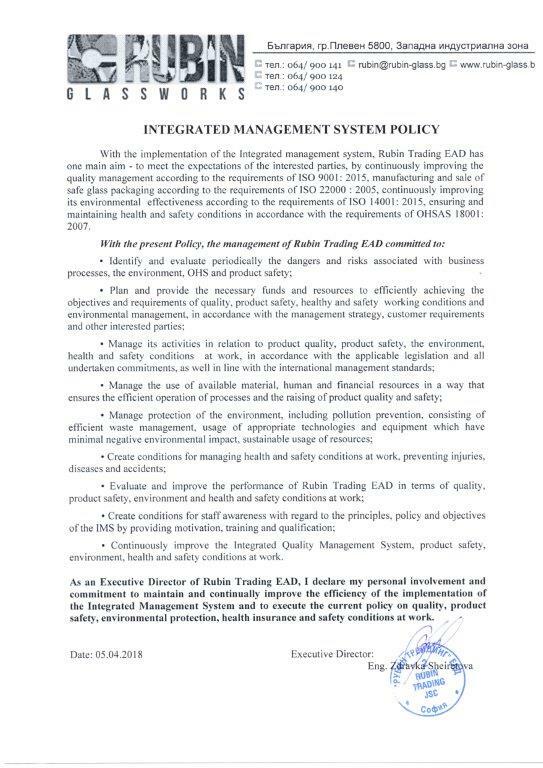 Through the policy of quality management, product safety, environment, health and safety work, the RUBIN TRADING JSC management declares its strategic goals and commitment to continuously improving customers satisfaction and the efficiency of the Integrated Management System. Integrated ERP system “SAP” for better business management. SAP is an integrated system for business management. It covers all work processes and departments in a single organization, by automating activities like financial and accounting management, marketing, production, HR, as well as the company’s relations with clients and partners. SAP is the leader amongst the ERP systems and offers functionality and solutions, that meet the needs of almost any company. SAP has many “Best practices” for the long presence on the ERP market and has a well-established global partner network and infrastructure. This system allows for faster return of investments and lowering of the Total costs of ownership (TCO). Providing an integrated solution for business management. Implementation of “best practices” throught the software. Standardization of internal corporate procedures and models of operation, which helps improve the working environment and the customer service. Avoids duplication and double entry of information. Improving the management of inventories and assets of the company. Support the development of the company and increase its flexibility. Increasing revenue through the ability to generate diverse analyzes that help to respond quickly and appropriately to changes in the market environment. Improving cooperation between the departments in the company.